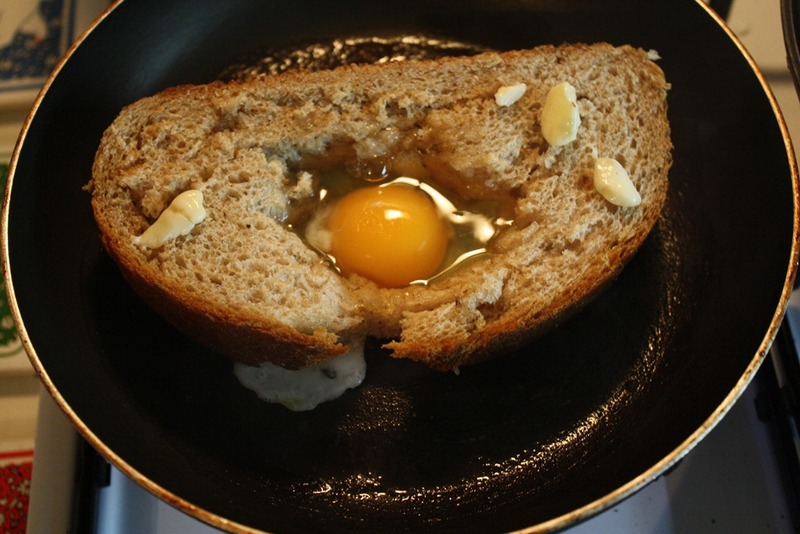 This meal goes by many names, but I call it “bird nest”. 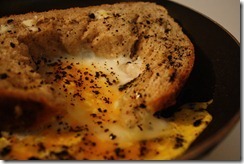 Essentially, it is an egg cooked in a (holed) slice of bread. 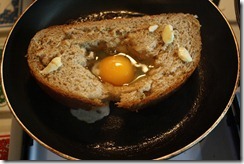 This past Sunday, I made a messy version of the bird nest. 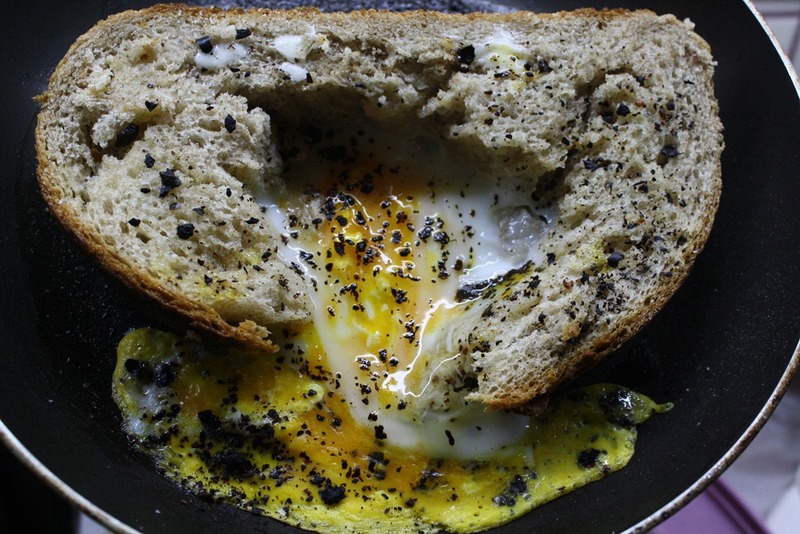 Cooked lightly with butter and seasoned simply with salt, pepper, and smoked red pepper flakes, the bird nest made the ideal Sunday brunch. 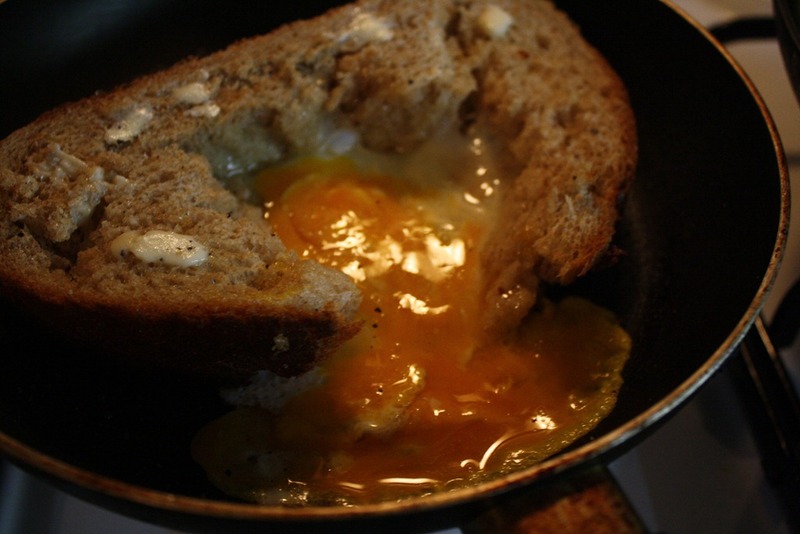 And while I generally pay moderate allegiance to food combining principles, and this combo violates a cardinal rule (don’t eat a starch and protein in the same meal [i.e. 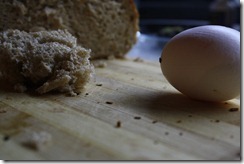 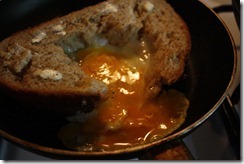 bread and egg]) in the whole food combining scheme, I find it a worthy violation. 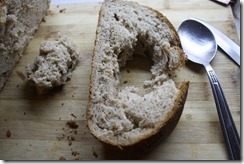 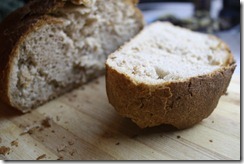 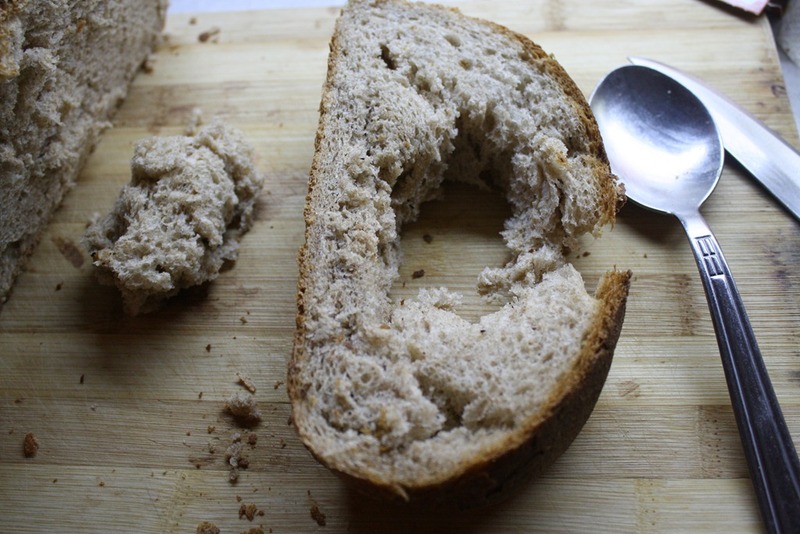 Cut a thick slice of your favorite bread, but make sure your choice is not too dense. 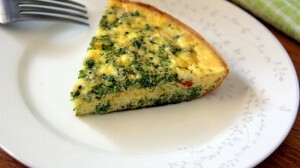 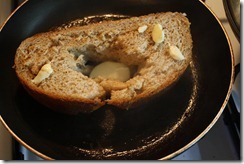 Pull an egg-sized hole chunk directly out of the middle of the slice. In a lightly buttered saucepan, begin to brown one side of the bread. 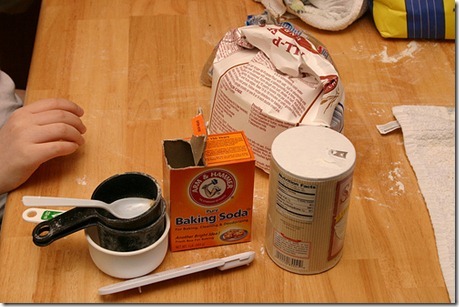 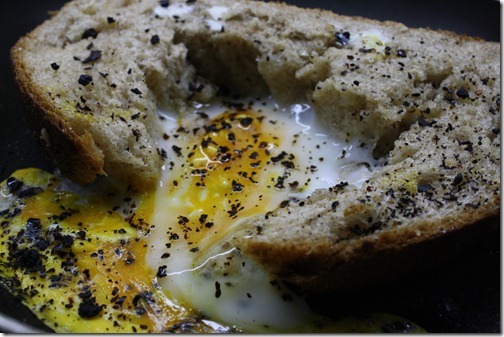 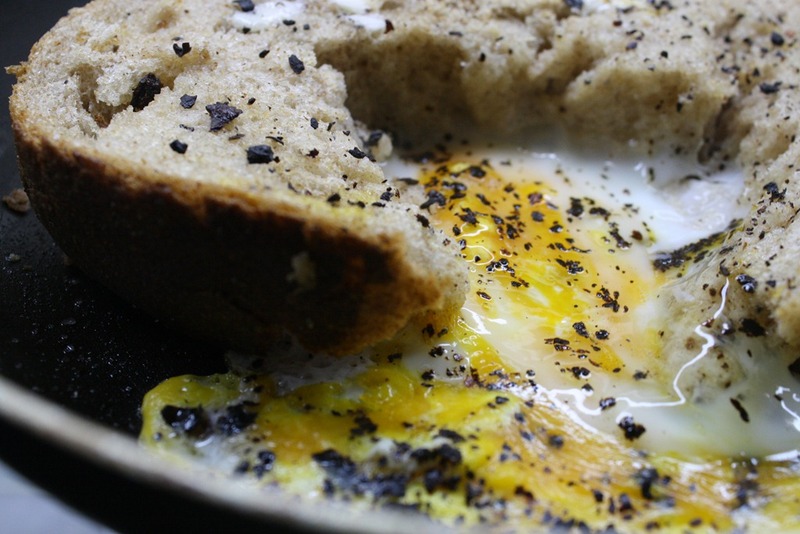 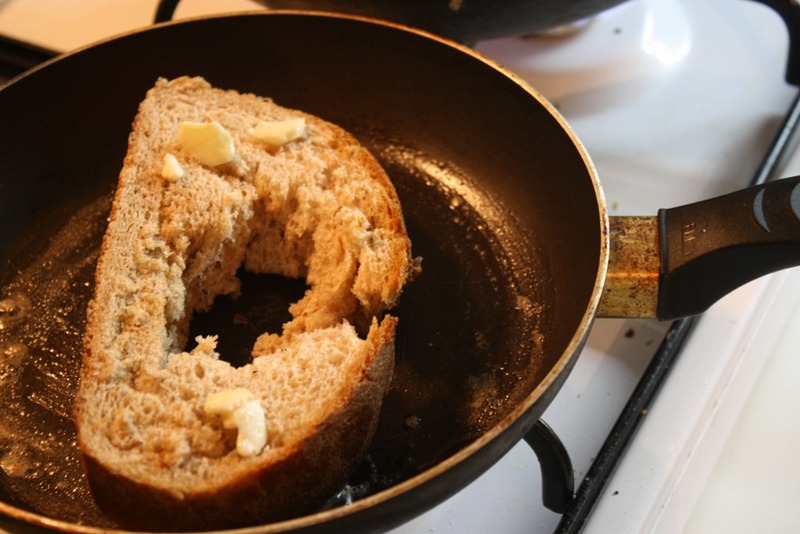 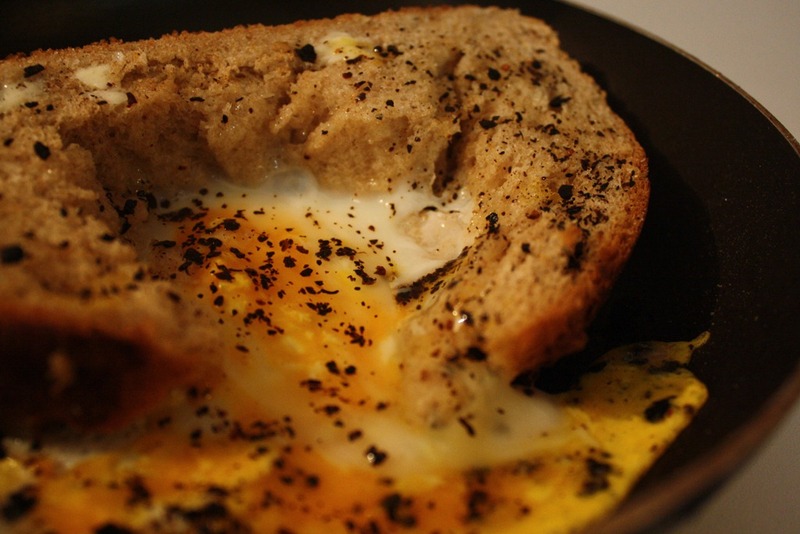 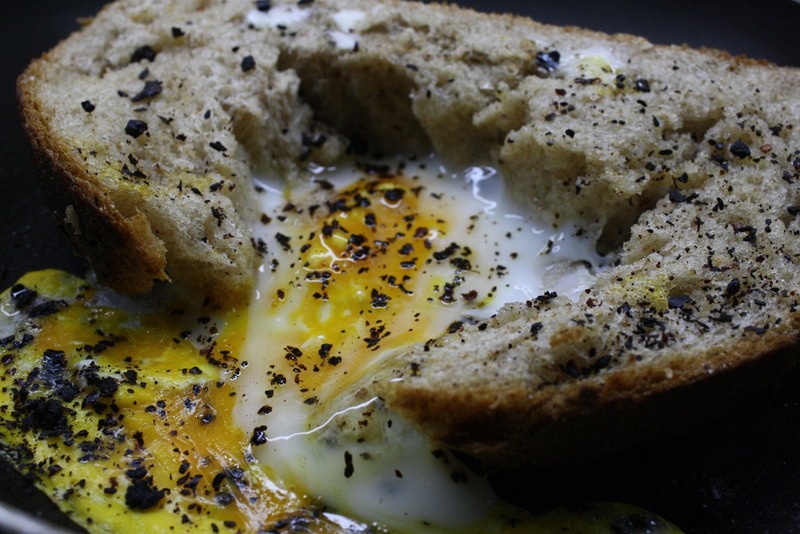 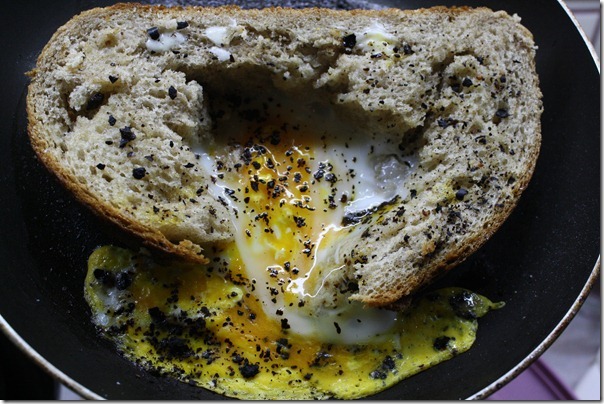 Drop a 1/2 tbsp of butter in the center of the hole in the bread and crack the egg on top. 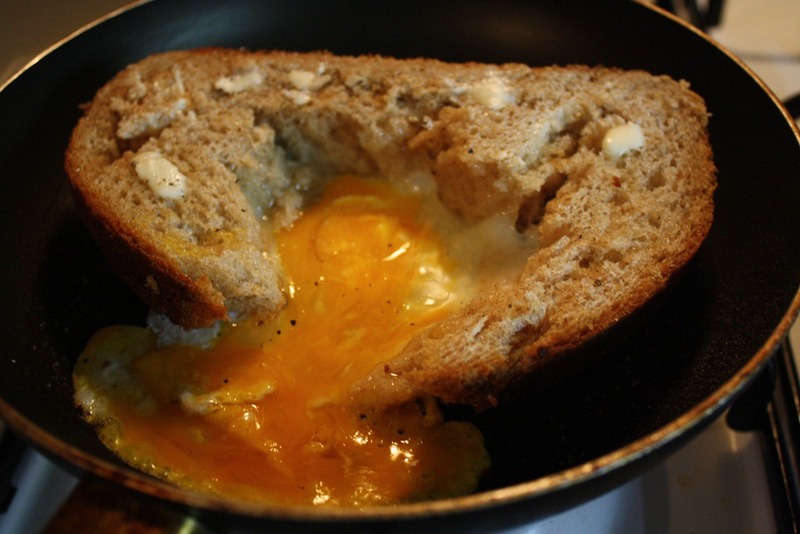 You can either let the egg cook fully in the confines of the bread, or let it drain out to have a more earthy, wooden table vibe to it. 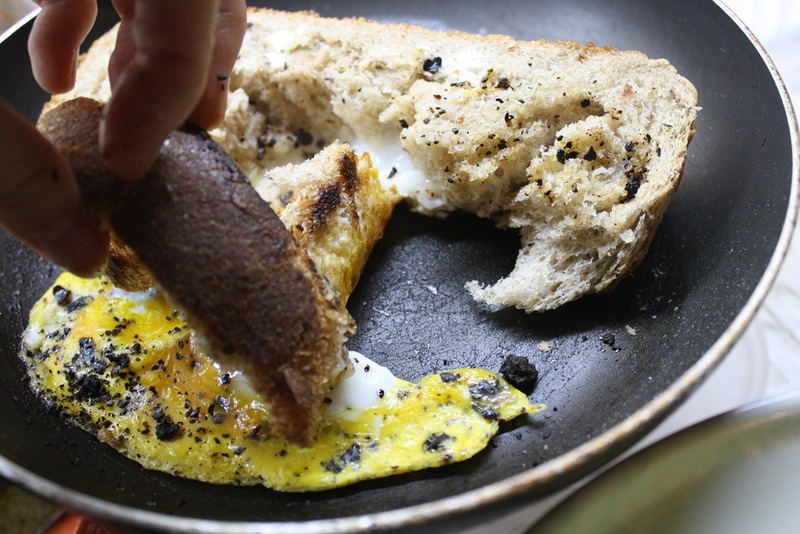 We Turks are all about dipping and cleaning our plates with bread, so I let my egg drain out of the side. Season with salt, pepper, and red pepper flakes. 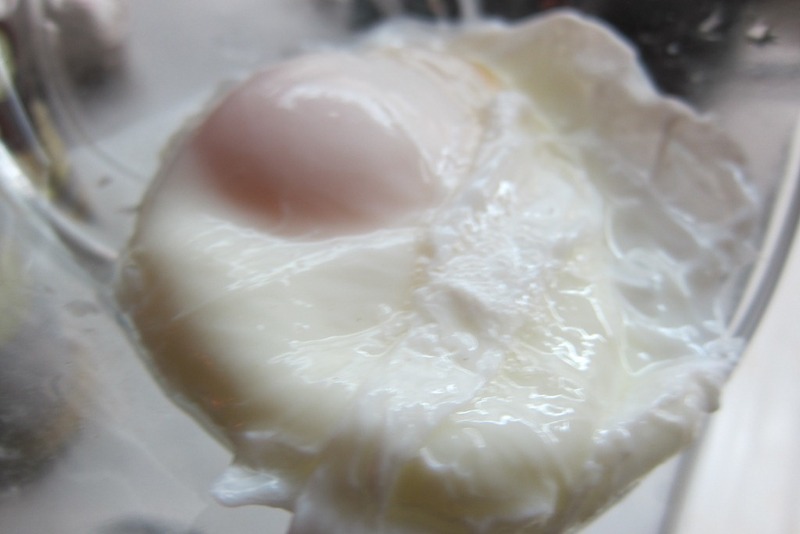 Wait until the egg reaches your level of preference (i.e. 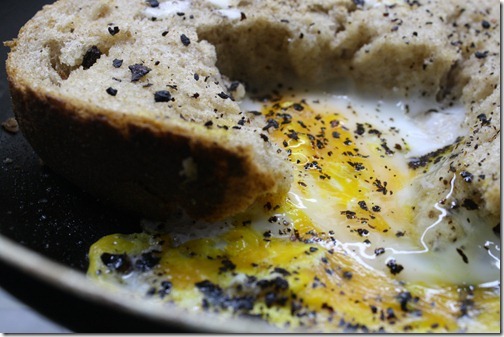 easy, over easy, etc.) 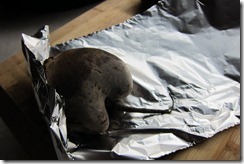 and remove from the heat. 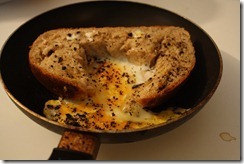 Eat directly from the pan, using the bread as your utensil. 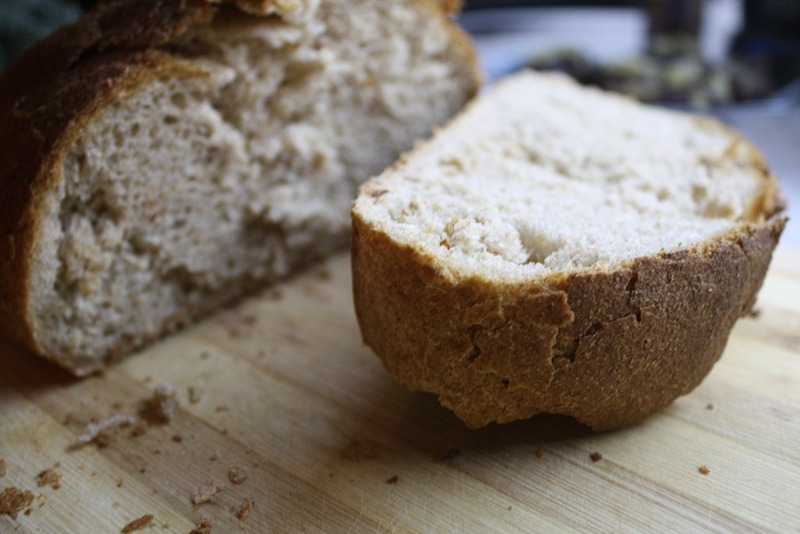 The bottom is buttery crisp, but the top is light, airy and warm. 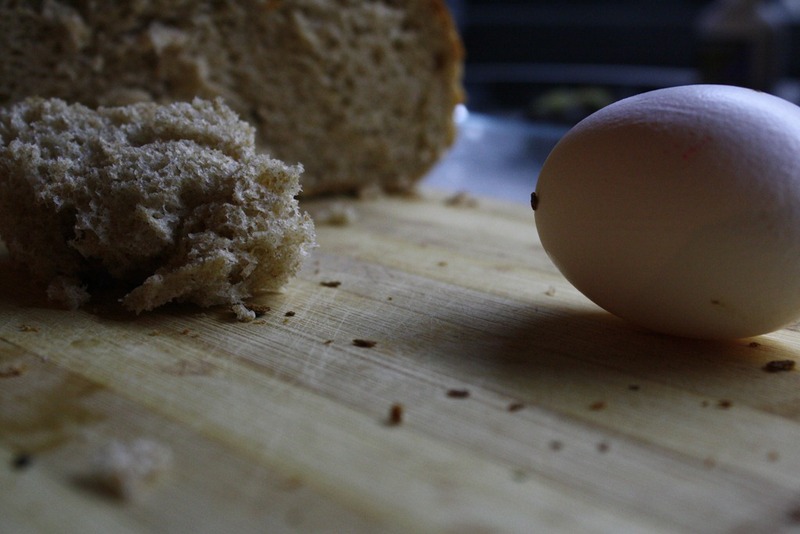 The contrast perfectly balances the seasoned egg. 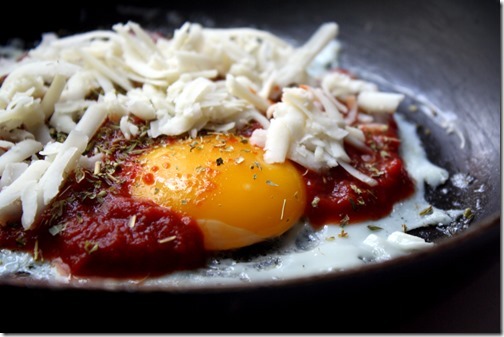 The perfect savory Sunday brunch. 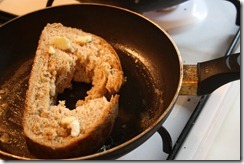 But, if you crave a little more sweetness, drizzle honey of maple syrup, smear with your favorite jam, or eat aside fruit. 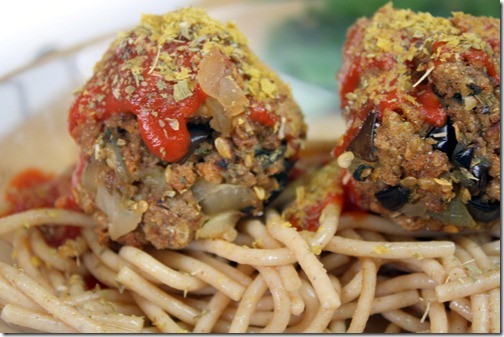 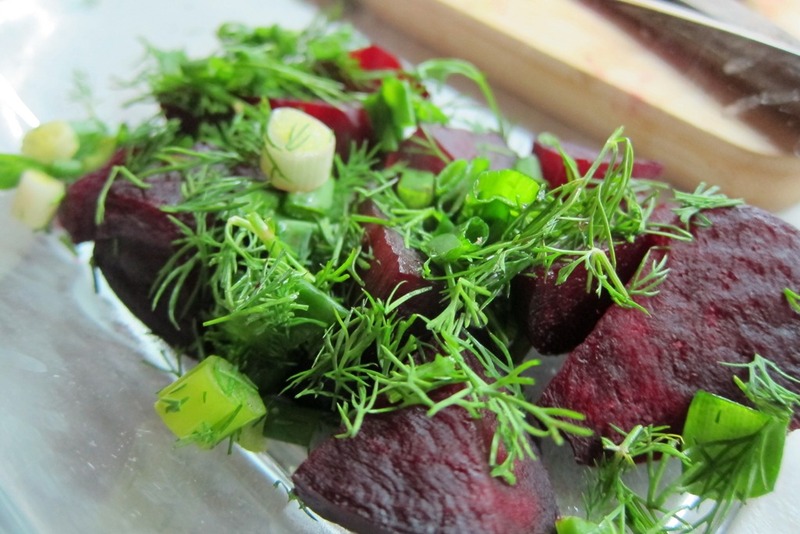 The cooler months make me crave some starchier vegetables and deeper flavors. This cool beet salad topped with warm poached egg is a great part of Sunday brunch. 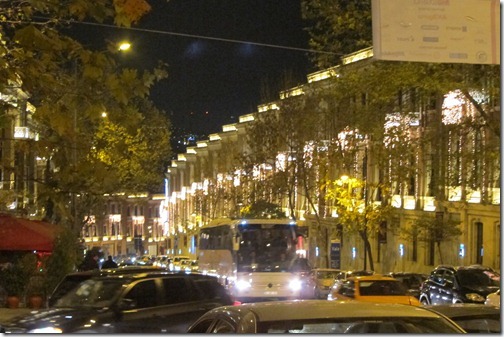 There may not be much holiday cheer in Istanbul, but the city is still lit up like a Christmas tree. 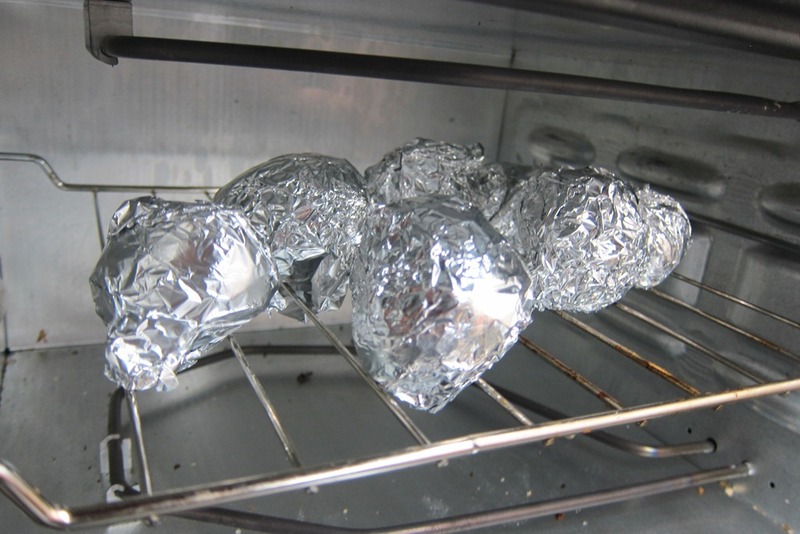 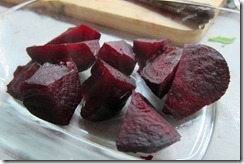 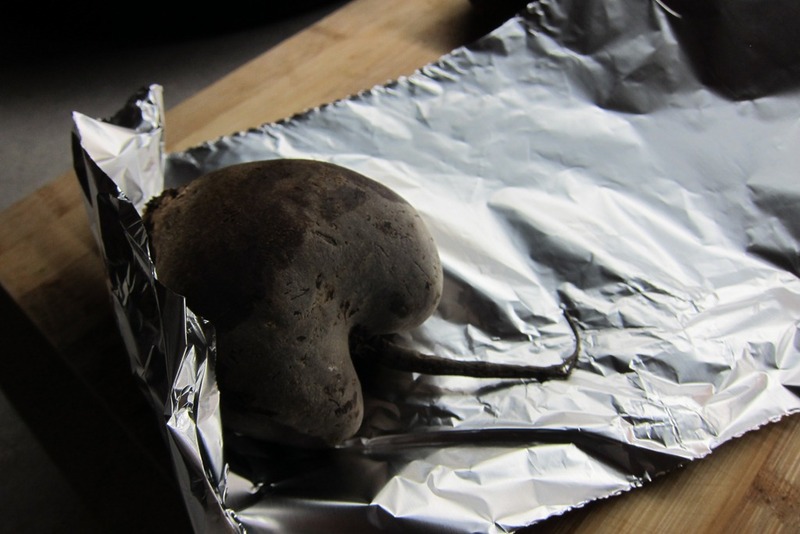 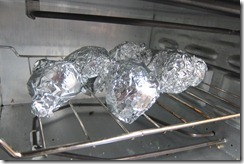 Wrap each beet individually in aluminum foil and pop them into the oven at 375 degrees Fahrenheit for 2 hours. 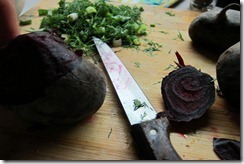 My beets were especially small, so I had to use a few more. 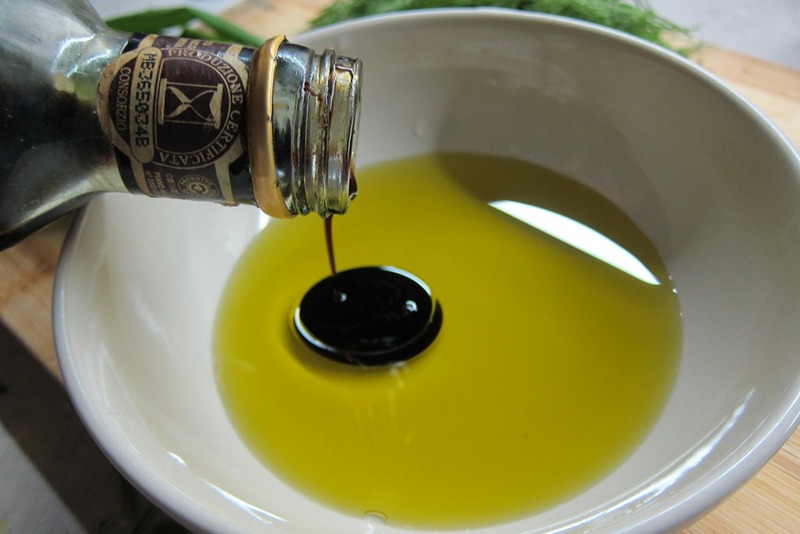 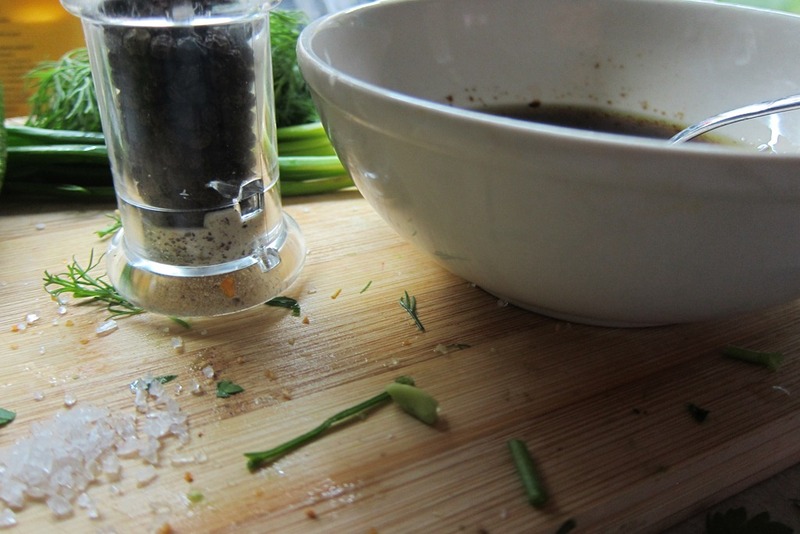 Meanwhile, whisk together the olive oil, lemon juice and balsamic vinegar with a pinch of salt and pepper and set aside with the chopped chives and dill. 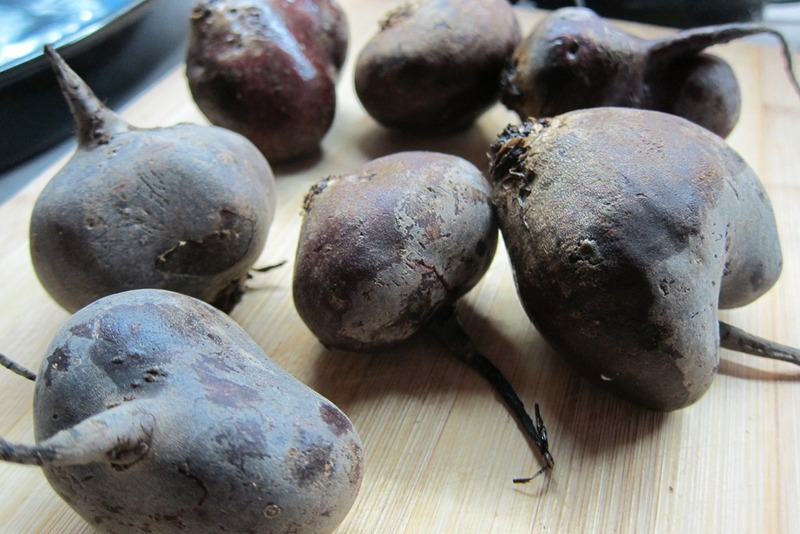 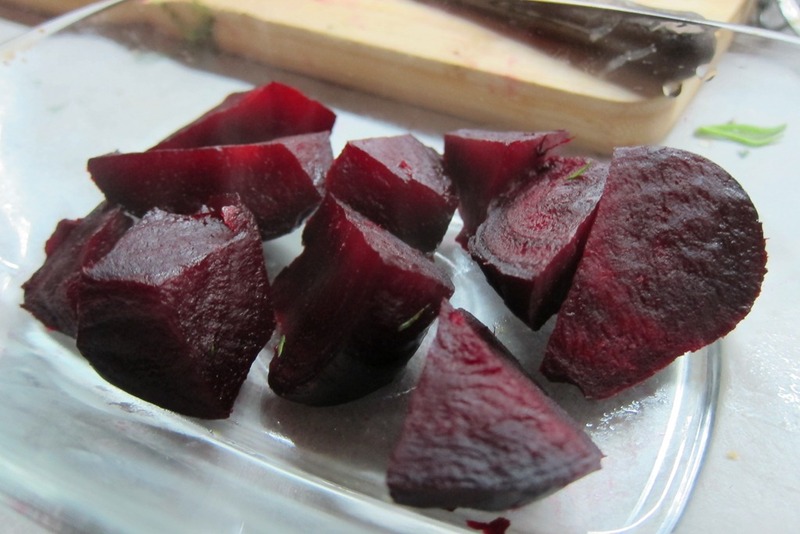 When the beets are tender (can prick with a fork, but still hard enough to give some resistance), remove them from the oven, unwrap them, and let cool until you are able to remove the skins by rubbing your thumbs against the surface. 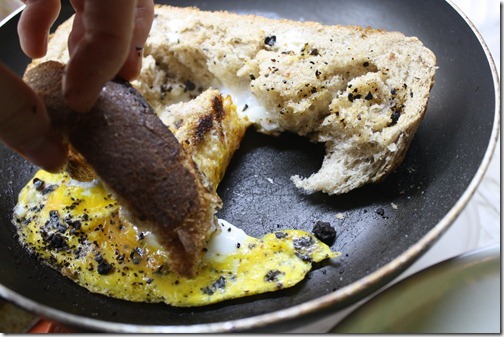 The skin should slide off relatively easily. 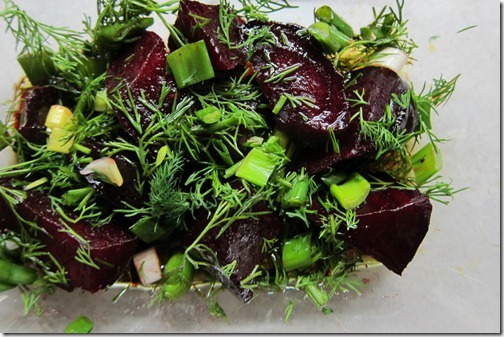 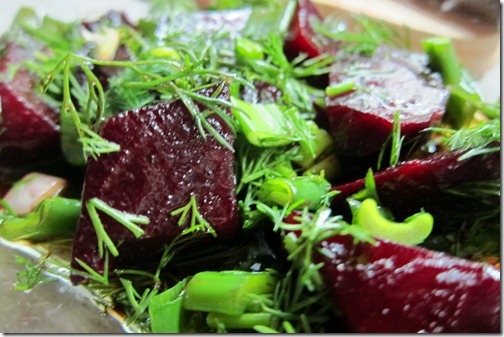 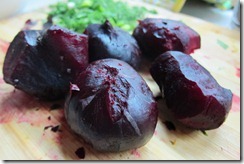 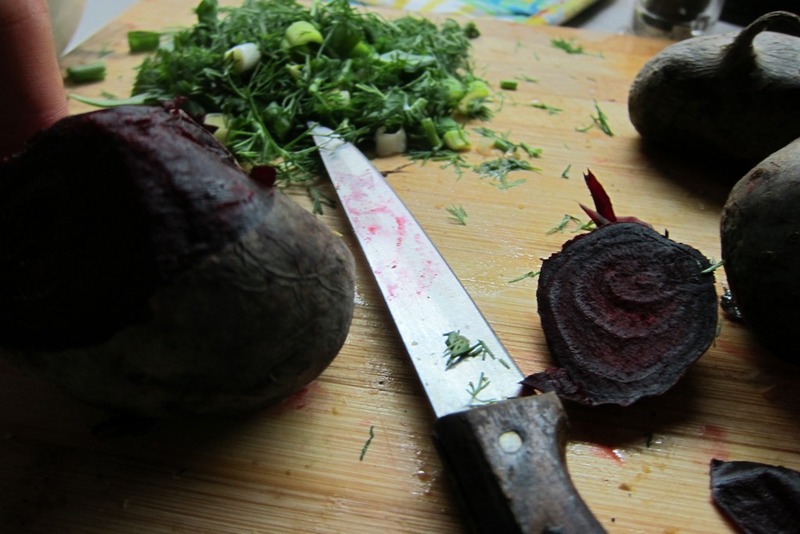 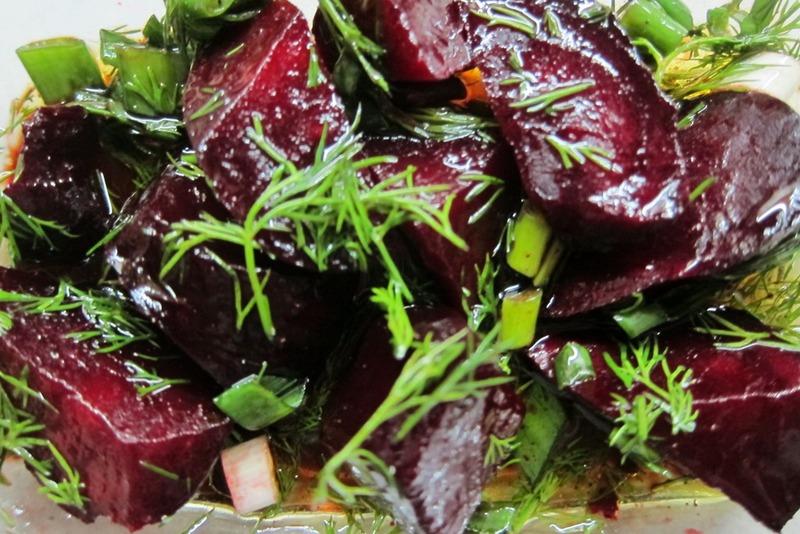 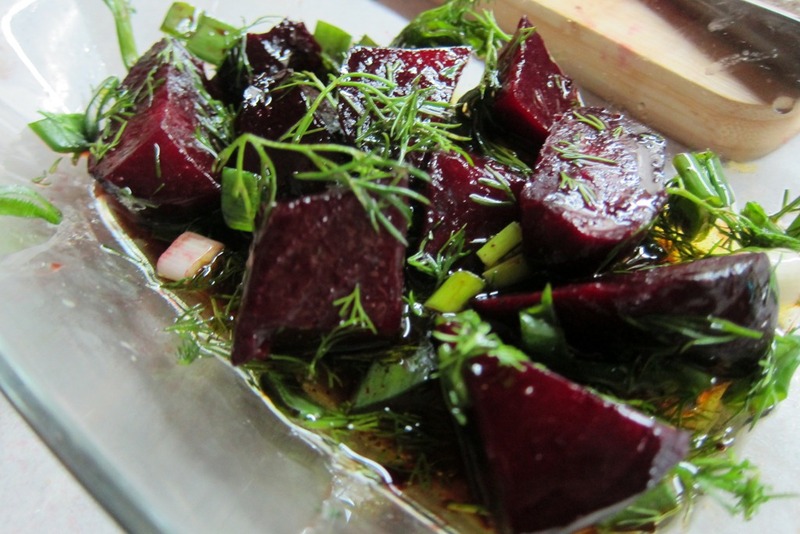 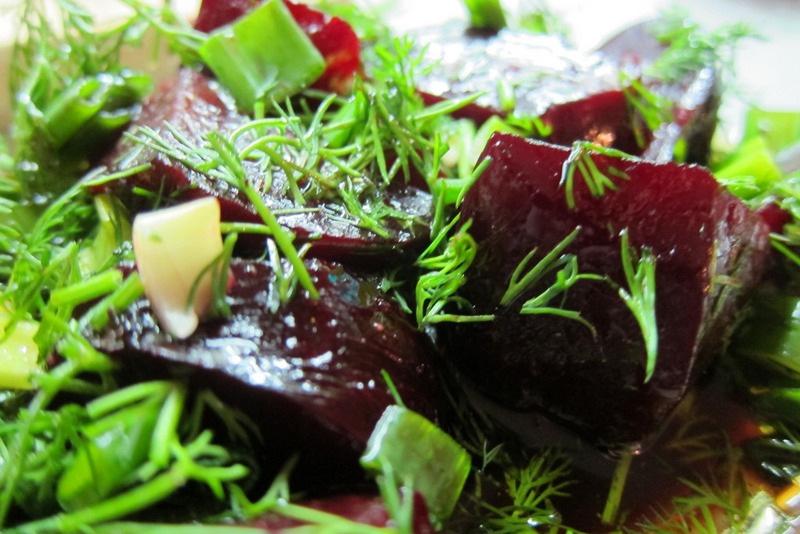 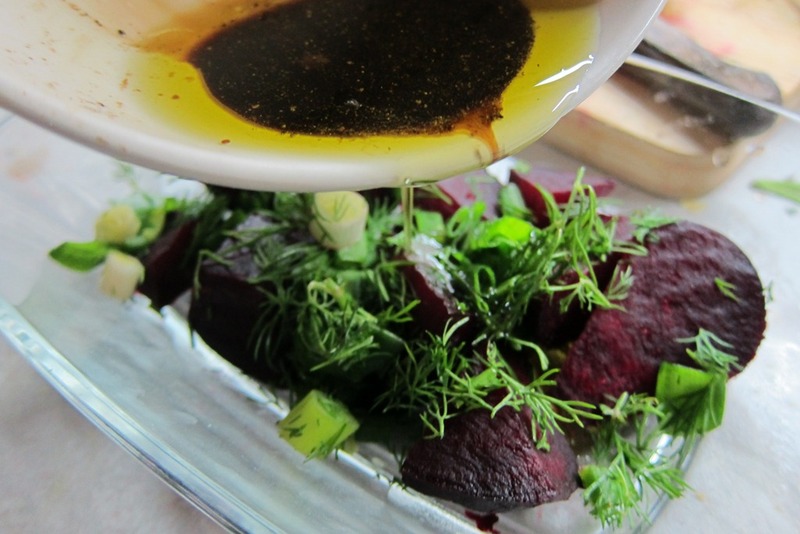 Chop the beets into quarters and place them in a dish. 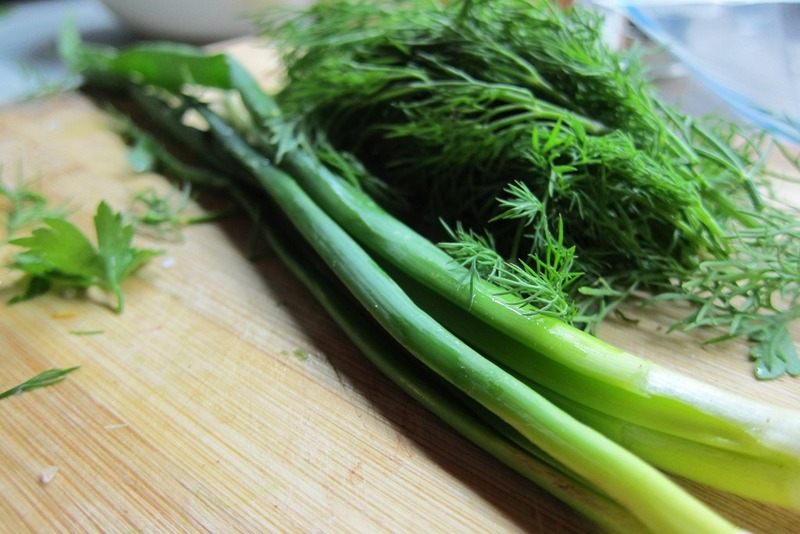 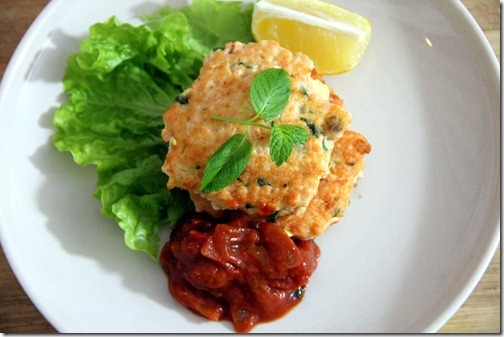 Top with the olive oil mixture, dill, and chives and let sit in the fridge for at least 30 minutes. 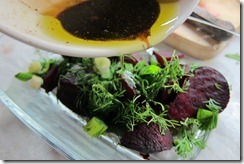 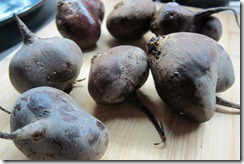 This allows the dish to cool down as well as the beets to absorb the flavor. 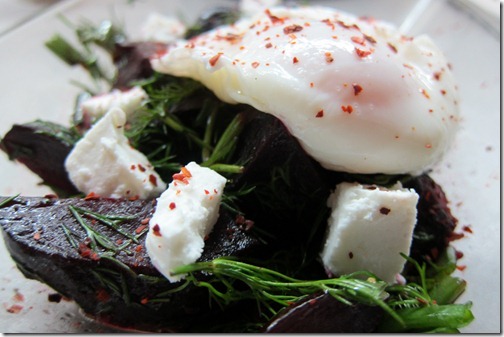 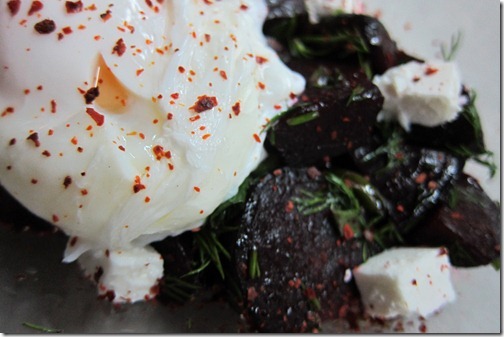 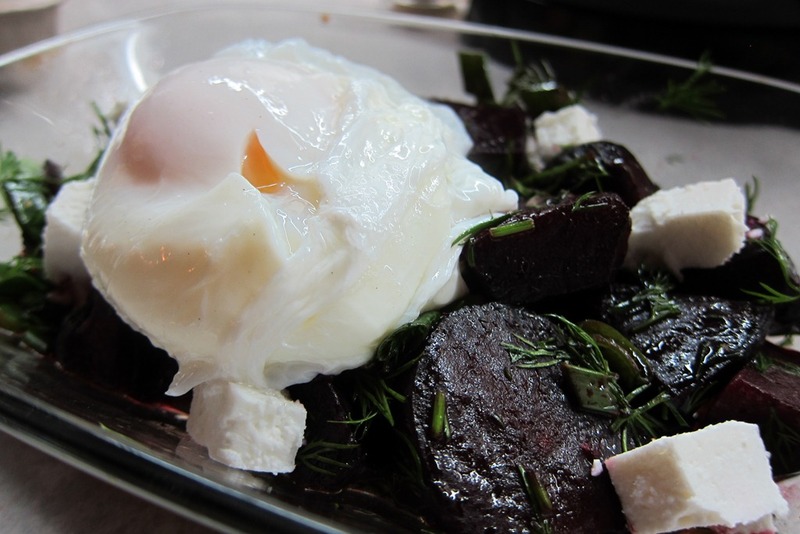 Before you remove the beets from the refrigerator, prepare the poached egg. 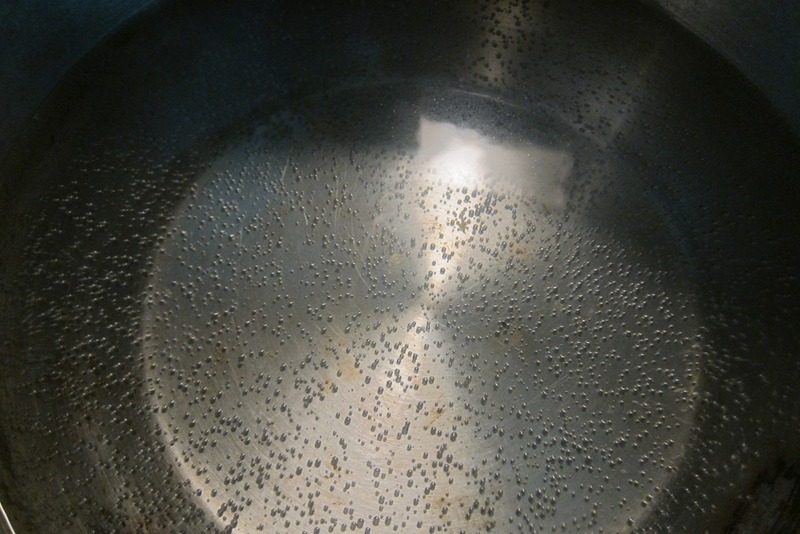 Crack an egg in a small bowl (makes it easier to place in the water to cook) and wait until a pot of water has reached pre-simmering status, meaning it has not begun to bubble at the surface—simply to have bubbled a bit at the bottom of the pot and the top of the water is letting off a steam as if about to simmer. 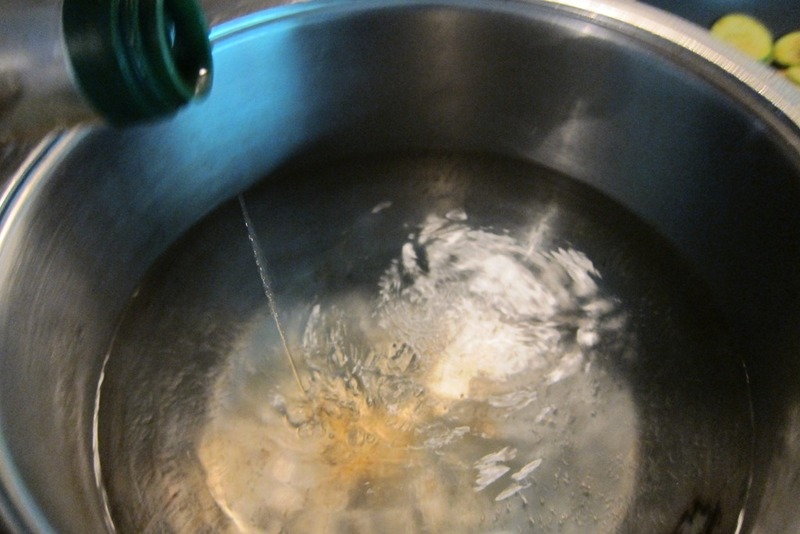 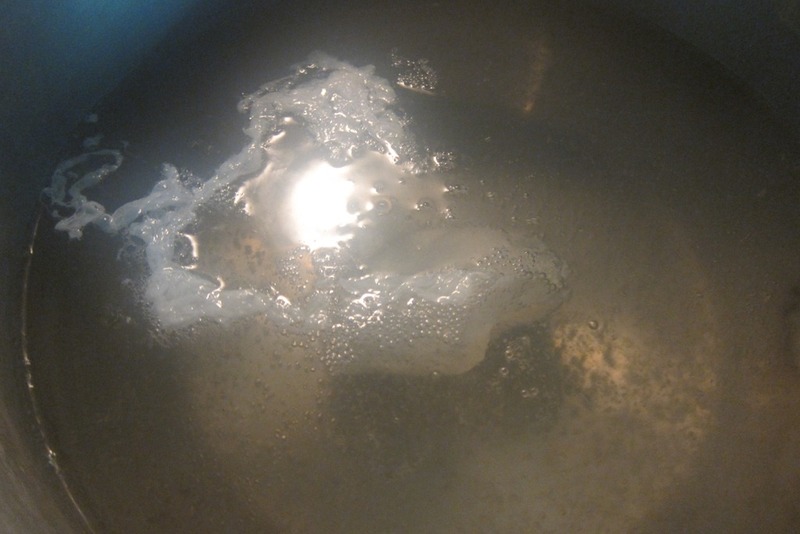 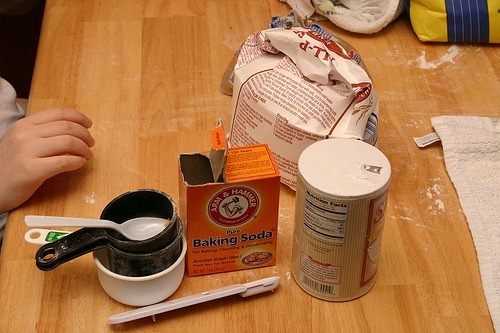 When you reach that point, reduce the temperature of the stove so the water doesn’t begin to simmer or boil. 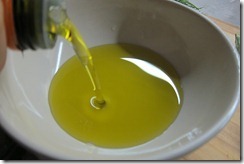 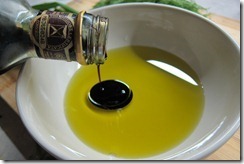 Add 1 tbsp of vinegar to the water (this helps the egg keep tight) and slide the egg into the water. 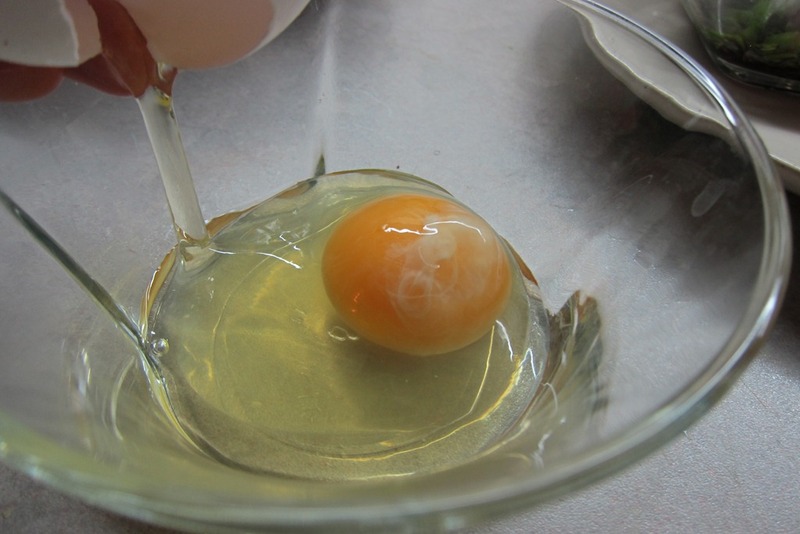 It will look a bit messy at first, but the egg will tighten and hold together. 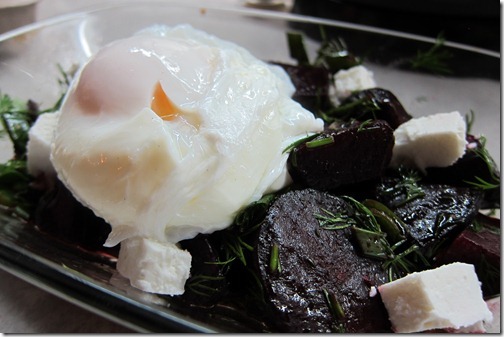 After 1 minute, remove the egg and place on top of the beet dish along with some goat cheese. Season with a bit of red pepper flakes.